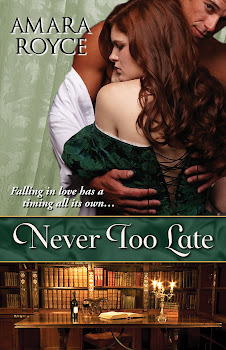 I just got word from Kensington Publishing that they are putting some of their e-book titles on sale June 11-25, and NEVER TOO LATE is among them! It should also be on sale for iBooks! So no matter which e-reader you favor, don't miss this great deal! In other news, things will likely be quiet on this site for the next few weeks because I'm writing on deadline. Book 2 (ALWAYS A STRANGER) is due in my editor's hands by July 1. ALWAYS A STRANGER is set in the same world as NEVER TOO LATE, and Honoria and Alex have cameos. I'm very excited about this story, in part because it features a half-Japanese heroine, which presents unusual challenges in Victorian Britain, but also presents great opportunities to consider the growth of British imperialism and ethnocentricity in the period. Lots of wonderful and fascinating historical information to dig into! You'll probably still be able to find me chattering away on Twitter at random times, though, to help maintain my sanity. So feel free to say hi! And in case you missed them, check out my recent online appearances at Fiction Vixen (Weekend Feature) and RR@H Novel Thoughts (guest post about romance covers)!